ELMER: The Patchwork Elephant Show! The children’s show I’ve been writing for the past year and a half had its opening in Toronto, Canada this December. 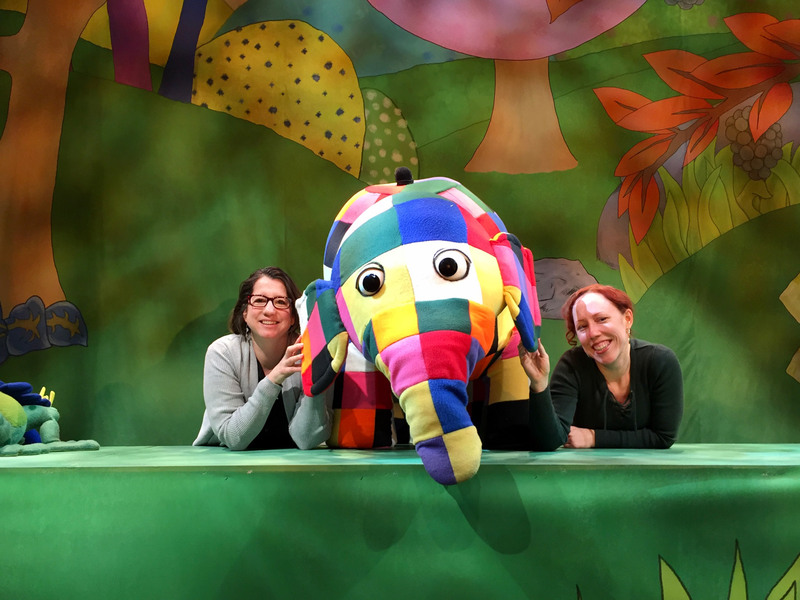 Suzanne Miller (the playwright) and I traveled there to see it, and it was thrilling to watch ELMER: The Patchwork Elephant Show come to life onstage with big beautiful puppets and a great cast. We also received the great news that they extended the 5-week run by another 4 weeks, and a cast album is in the works. Stay tuned for more information on this and on which city will receive ELMER next! All the elephants of the jungle are gray except Elmer, who is a patchwork of brilliant colors. His fun-loving and cheerful personality keeps everyone in a playful mood, until the day he gets tired of being different and tries to blend in with the herd. From the books by David McKee, “Elmer” is a celebration of individuality and the power of laughter. Adapted for the stage by Suzanne Maynard Miller, songs by Allison Leyton-Brown.